Aaron Thompson dribbles the ball against Seton Hall. The Bulldogs and Pirates meet for a third time on March 8. Jimmy Lafakis/Collegian file photo. The Butler men’s basketball team is headed to the Big Apple for the Big East Tournament. After a hectic conference schedule, it’s simple now. A four-day, single-elimination tournament will decide a Big East Tournament champion. The New York tournament is a simple concept to grasp, but the story of how the Bulldogs got to their 9-9 conference record and No. 6 seed in this bracket is a bit more jumbled. Highs included knocking off the No. 1 ranked Villanova Wildcats, one of only four Nova losses all year, while lows were highlighted by a home loss to Georgetown. The road win was one of only three for the Hoyas all year. Individually, forward Kelan Martin led the Big East in points per game during conference play, averaging more than 23 points. 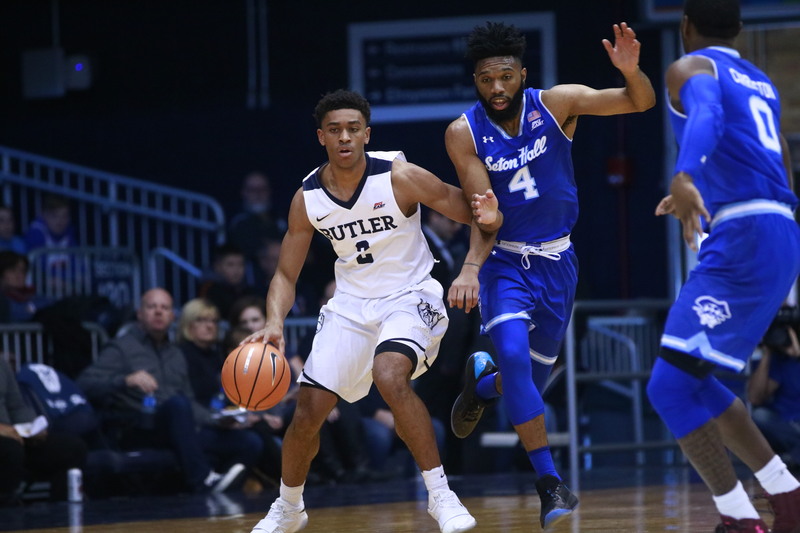 Guard Henry Baddley became the most efficient three-point shooter on the Butler roster and guard Paul Jorgensen made a three from Narnia against Villanova and became a spark plug for this Butler team. Now, the Bulldogs head to Madison Square Garden to play in a tournament they have never won a game in. Since joining the Big East in the 2013-14 season, the Bulldogs are 0-4 in conference tournament games. Butler is facing Seton Hall for the second time in the tournament. In 2014, the Pirates won a close one 51-50 in the first round. In a year of so many firsts — a new head coach, new coaching staff, new players, new expectations — can they add another first and win a Big East Tournament game? Butler’s first game will be against Seton Hall on March 8. The Pirates have not been kind to the Bulldogs this year, winning both regular season contests. The first matchup saw the Bulldogs give up a double-digit second half lead inside Hinkle Fieldhouse, and lose by three. In their second game, the last game of the regular season, Martin dropped 35 on the Seton Hall defense, but the rest of Butler was nowhere to be found on the offensive end. The result was a 77-70 loss. Khadeen Carrington and Angel Delgado have had their way with the Bulldogs. Delgado has 49 points and 25 boards in two games. Carrington has 54 points of his own. This is where the Bulldogs will need to focus their defensive efforts, specifically in the paint. Butler has struggled with consistent interior defense throughout the season. Center Nate Fowler and forward Tyler Wideman’s paint presence needs to be felt by Delgado the entire time he is on the floor. Guards Kamar Baldwin and Aaron Thompson have done a solid job all season as perimeter players, but something about Seton Hall has given them trouble. Carrington will be accompanied by another talented guard in Dezi Rodriguez, who did not play on March 3. Either the interior option or perimeter option needs to be shut down. It is very hard to beat this Seton Hall team when the production is coming from all over the court. Butler head coach LaVall Jordan is calling on a little faith and team defense. Offensively, Martin needs some help. Recently the offensive production has not been evenly distributed. Butler dished out only six assists in their last regular season contest which just will not get it done against a good basketball team. The balance starts with a better performance from Baldwin. This Butler team is at its best offensively when Baldwin is at his best. Martin can put up numbers, but the ball movement and flow of the offense starts with No. 3. In the 12 games that Baldwin dished out four or more assists, the Bulldogs were 9-3. On the 13 occasions that Baldwin failed to have more than two, Butler went 6-7. Beat Seton Hall, then what? First of all, beating Seton Hall and selection Sunday will be less stressful for everyone. As for the next opponent, Butler will most likely face Villanova following a first round victory. The Wildcats finished second in the Big East with a conference record of 14-4. The two teams split the season series with each team winning on their home floor. The Wildcats play the winner of Marquette vs. DePaul before a potential showdown against the Bulldogs. After that? Who knows. Conference tournaments rarely go the way they are supposed to. But basing predictions on seeds alone, wins against Seton Hall and Villanova would land the Bulldogs in the title game up against the No. 1 seeded Xavier. All the predictions, theoretical scenarios and analyses have come and gone. The rest of the season features two choices: win and move on or lose and go home.